Please refer to our stock # 2107 when inquiring. 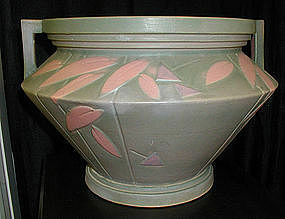 Roseville Futura jardinaire measuring 10" x 14 3/4" wide, this grey outside with pink leaves is in perfect condition. The inside has some water stains as it was used for plants, but it is otherwise perfect original condition.